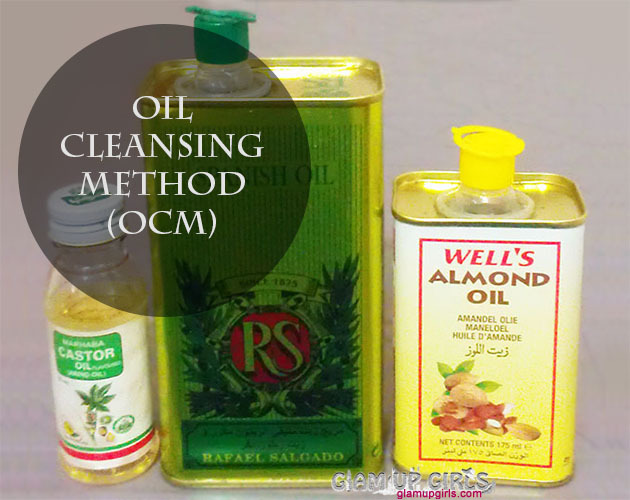 Have you ever hared of Oil cleansing method (OCM)? OCM is on the web for few years and many have got very good results from this method. People with acne prone to dry flaky skin have benefited from this method. Lets explore about OCM in detail in our today's post. What is Oil Cleansing Method (OCM)? The oil cleansing method is based on the fact that like substances dissolve like substances. As we know that our skin naturally produces oil which keep skin healthy, help heal, protect and moisturize our skin. Oily skins will want to stop their skin producing extra oil and dry skins will always need more moisturizer to keep their skin hydrated. By looking this scenario we can safely say that our skin needs balance and that is the point where OCM is going to help us. Oil cleansing method brings balance to your skin whether it is oily or dry. Now some of you probably think that how oil cleansing is going to help control oil on oily skins. Well if you have seen any researches or read articles on skin treatments you would know that if you try to strip oil from oily skin with harsh chemicals your body will produce more oil to counter the damage on your skin. Oil Cleansing Method is a process where you massage your face with mixture of suitable oils on your skin which will remove dirt and impurities while balancing the oil requirement of our skin leaving it healthy and glowing. Using OCM properly can solve the issue like oily, dry, sensitive skin, blackheads, white heads, acne etc. What is needed for OCM? For OCM you need mainly two types of natural oils mixture. One is astringent oil and other is conditioning oil. Astringent oils are good for oily to combination skins because they are drying and are helpful to shrink the appearance of pores and loose skin. Castor oil, Hazelnut oil, Grape seed oil are few falls in astringent oil category. Conditioning oils help to nourish and moisturize the skin and good for dry and dull skin. Olive oil, Almond oil and Sunflower seed oil are few examples of conditioning oil. Depending on your choice and availability you can pick any combination but the best mixture among people who benefited from OCM is castor oil and olive oil. I have dry skin so i add 1 tablespoon of castor oil and 2 tablespoon of olive oil. You can mix these oils and keep in bottle for easy use but until you are not sure mix small amount and watch closely which ratio works best for you. Step 1. take small amount of oil in palm and gently massage on face and neck. Once you feel that right amount of oil is absorbed into your skin it is time to move to step 2. Step 2. Take wash cloth and soak it in warm water. Put this cloth on your face to give it a steam until the cloth cools down. This will bring out dirt and impurities in your skin. Step 3. In last step rinse your wash cloth with warm water and gently clean your face from impurities. In this step you are doing exfoliation which will remove dead skin and other residues. These 3 steps will leave your skin neat and clean and you might not need any toner or moisturizer. Some oily faces have observed some breakout after this method initially but it is recommend to continue with this method and it will cure your acne in long terms. However as i have dry skin i did not suffered from any break out. How often to use OCM? Most recommended to use 3 to 4 days a week but it depends on you. You can start using this method daily and then start creating gap like every 2 to 3 days. You will start seeing good result immediately but in acne cases you need to give this method a time to cure it. I have used this method for my dry skin and i am very pleased with the effects. I have very dry patches around the mouth which turns dark some times in winter. There is no moisturizer which worked best for this issue, i used to apply almond oil at night as moisturizer which worked OK for me. Now as i have tried OCM it definitely looked better then before. It is good to heal and cure skin issues with natural way and if it is working for you what can you ask more. I switch olive oil with almond oil often as i desired. Once you get to know your skin you will enjoy doing it and can add oils of your choice but for starters it is good to stick with main ingredients. If you are confident enough and nothing else has worked for you, give this method a try who knows when there is turning point and you get soft, clean and glowing skin. Disclosure: All the data and information is not solely mine but gathered from different online articles and reviews. To get more info according to your skin type and issues search thoroughly before using this method.